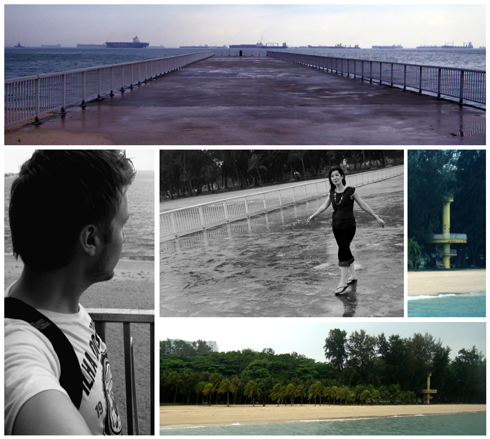 It had clouded over, but both Stephanie and I agreed that we had to make the most of our final day in Singapore. From our hotel we could see the water, and with our afternoon free we decided to find our way to the shore. We'd spent a week on this island in Southeast Asia, and now we just wanted to put our feet in the South China Sea. Miles of lush greenery hugged the coastline and we soon found ourselves walking amongst fresh flowers and tall, wiry trees. You could feel the cool breeze rolling in as the sky foreshadowed the coming rain, but the shifting weather seemed to only enhance the walk we were on. In some ways it was just another park, and yet that day I was keen to believe that I'd never seen anything quite like it. We reached the edge of the beach and walked to the waters edge. You could see that there was a small shelf to stand on as the waves rolled in, but this was no place to swim. Through the water you could see how the beach sloped dramatically into the ocean and disappeared into blackness. Hundreds of cargo ships lined the horizon, and in some ways it was a bit foreboding. In retrospect it's probably what makes the moment standout in my head. Like a couple of kids testing the temperature of a swimming pool, we cautiously took a few steps. Then a few more. My sandals sunk down in the soft sand and in an instant the waves were crashing and swirling around my feet. Taking deliberate steps and curling my toes in the cold water, it was one of the few times on the entire trip that I felt completely in the moment. So this is what it feels like to stand in the South China Sea. 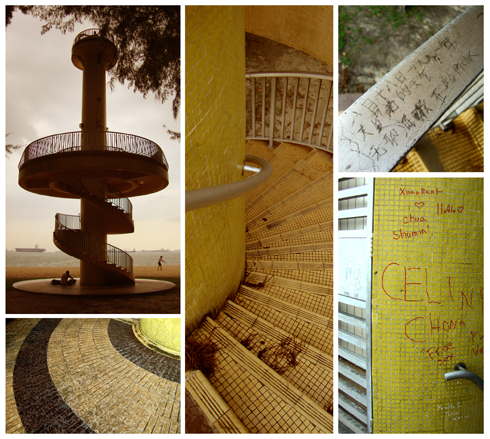 A bit further down the beach we spotted a yellow lighthouse tower with a spiral staircase leading up to a round platform. It was one of the few places in Singapore that we'd actually come across graffiti of any kind (the country is notoriously well groomed). We browsed the English and Asian characters scrawled and carved haphazardly on the bright yellow facade, and it rang true that no matter where you are in the world, some insults are clearly favorites for everyone. That was when it began to rain. 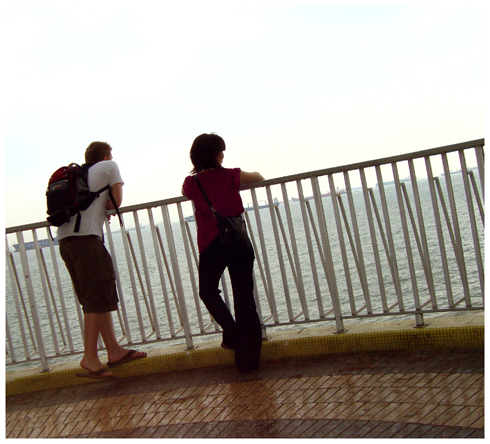 We left the tower and headed for a nearby concrete pier to get a better vantage of the beach we had just walked. The sprinkling rain soon became heavy drops, and as we approached the empty pier a roar of thunder announced the arrival of showers. There was no avoiding the onslaught, and yet it didn't seem to matter. Another epic crack of thunder boomed overhead and then echoed off of the open water around us. As we noticed others scrambling from the beach, Stephanie and I quickly became soaked from head to toe, lost in our own make-shift adventure. 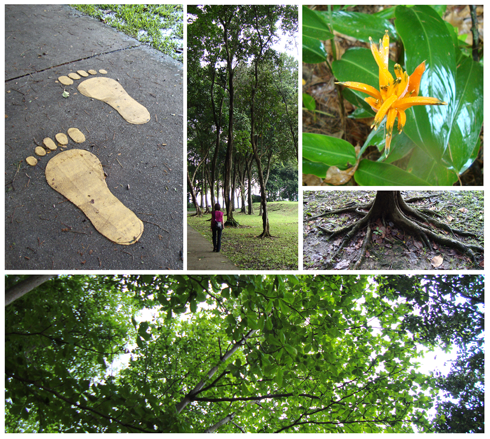 Here we were in Singapore, on a business trip no less, and yet we'd been able to take time to just appreciate where we were - to let loose, to experience a wealth of new things, and to cap it off with something as simple and gratifying as this. The doorman at our hotel cracked a big smile upon our return, with no explanation about the weather required. We still apologized for dripping. 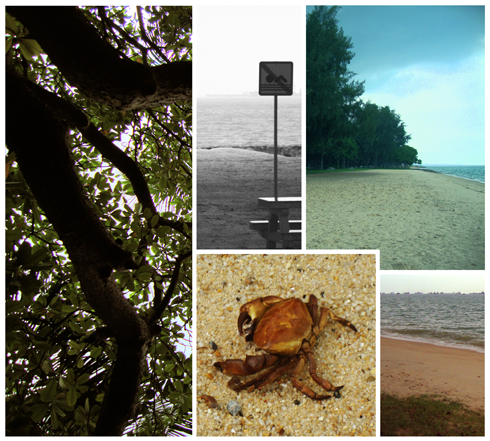 It was a rainy afternoon on the coast of Singapore. April 16, 2010. Very nice post, sir! It's days like the one you wrote about that I remember as well. There's always an energy in the air when a storm is coming. Usually it's a "I love this moment" kind of attitude, but what's cool is that same storm can mean impending doom for another individual - or give off a certain darkness. Thinking about Singapore one year later just reinforces how surreal the entire experience was and how lucky we were to have been given the opportunity. Luke, thanks for capturing these moments from the trip. 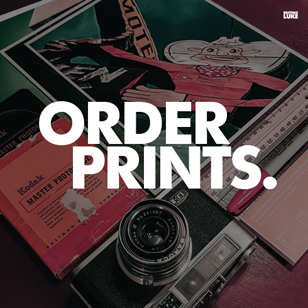 It was your approach that inspired me to get back into photography and push my creative blog concept from just an idea into a reality!